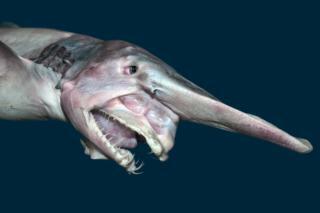 Before we get going on this list of the world’s deadliest fish I’m going to tell you what I’m not putting on the list. Firstly, sharks – technically they should be occupying most of the top spots but as I’ve already done a rather excellent article on the most dangerous sharks I’ve decided not to repeat myself. The other thing that won’t be appearing on this list are jellyfish. There seems to be a little confusion on other websites about the nature of these squishy invertebrates. They are most definitely not fish, in fact they are as much a type of fish as we are. Also known as the toothpick fish on account of its slender shape, the candiru (Vandellia cirrhosa) is one of the Amazon River’s more notorious inhabitants. This tiny catfish’s unpleasant reputation probably stems from its other name – “the vampire fish”. The candiru feeds by attaching to other fishes gills and tapping into the many blood vessels that are located there. What this mischievous little fish is said to do to humans is far worse than a little blood-sucking. The story goes that the candiru has a penchant for swimming up men’s toilet parts where it becomes virtually impossible to remove owing to its backwards facing spines. And it gets worse; you don’t even have to enter the water to be vulnerable to attack. One victim claimed that the little river monster swam up his stream of pee and inserted itself. Now, if you have read my other article on the candiru you will know I am a little sceptical as to any of these claims and would suggest it is in fact something of an urban myth. Firstly, there has only ever been one documented case of it actually happening and this seems to be full of inconsistencies. In fact the American marine biologist who investigated the case suggested the likelihood of being attacked by a candiru in this manner was about as likely as “being struck by lightning whilst simultaneously being eaten by a shark”. Moray eels are actually 200 separate species of fish but it is the giant moray that we are most interested in. Whilst not exactly gigantic this is still a big enough fish to cause some serious damage. They can reach up to 3m (10ft) in length and weigh up to 30kg (66lbs) which puts them fairly high on the food chain. The moray eel also possesses three rows of very sharp teeth and, not just one set of powerful jaws, but two. Actually, all fish have two sets of jaws but the moray eel is the only one that can shoot these second jaws forward to drag its prey down its throat. While humans are not on the moray’s menu there have been plenty of attacks over the years. It isn’t that these eels are particularly aggressive, they are quite shy and just don’t like being disturbed when they are hiding away in their burrows and have notoriously bad eyesight. One of the most common scenarios for an attack is when divers have been hand feeding eels. When they do attack the resulting bite can be more severe than you’d imagine. There have been numerous cases of thumbs and fingers being more or less bitten off and other incidents in which major reconstructive surgery has been required after bites down to the bone. Once the moray eel clamps down on a victim it is very difficult to remove and is unable to release, even in death. 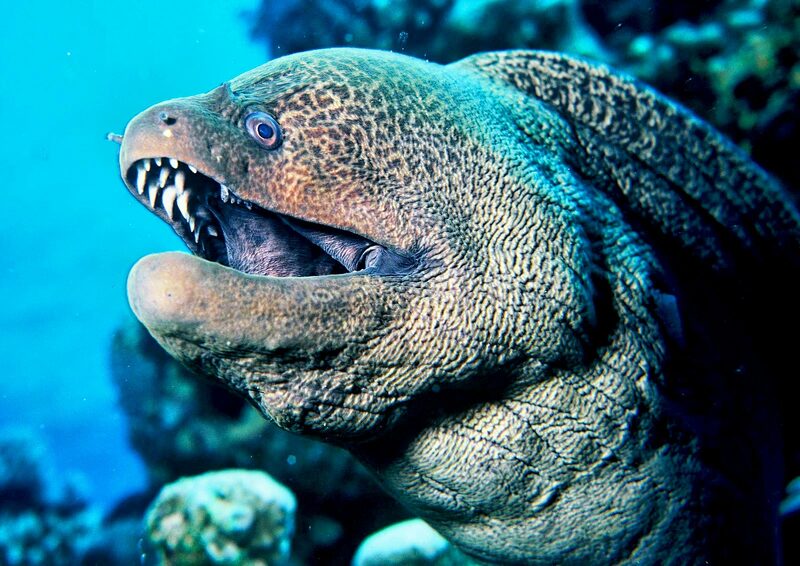 In addition, like many reef fish higher up the food chain, it is inadvisable to eat moray eels. This is because they accumulate high levels of ciguatoxins from their diet – a fact not lost on the 57 people in the Mariana Islands struck down with poisoning after eating a stew with just the eel’s head in it. 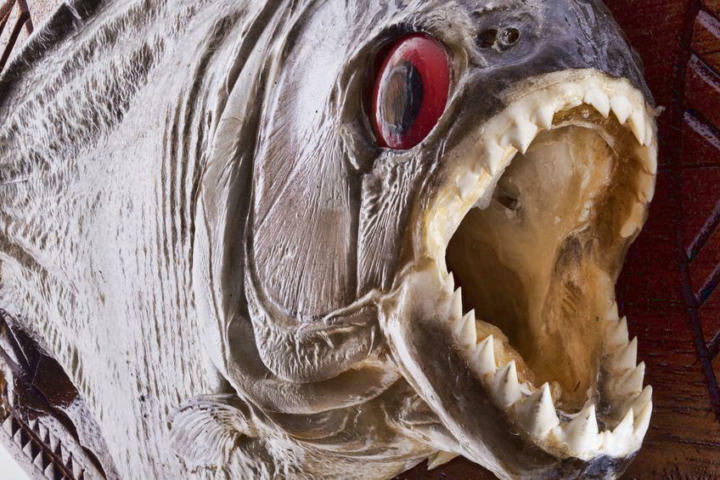 The tigerfish is sometimes referred to as the “African piranha”, but this doesn’t really do this truly terrifying fish justice. Like its South American cousins the tigerfish may hunt in groups and has powerful jaws lined with razor-sharp teeth, but it is a much scarier proposition. Weighing in at up to 70 kg (150 lbs) and nearly 1.6m (5 ft) in length these fish are also known to have something of a vicious streak. 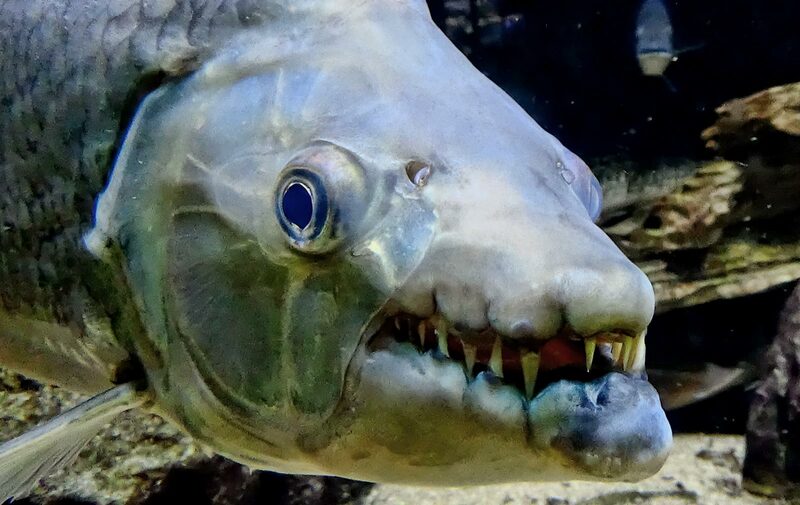 And in case you hadn’t noticed the Goliath tigerfish has rather large teeth – 32 of them in fact with each one around the size of a great white shark’s. Found in the murky waters of the Congo River and Lake Tanganyika, local legend says that the evil spirit “Mbenga” enters the fish and causes it to attack people. But it isn’t just people these monster fish have been known to attack; apparently even crocodile is on the menu with reports of bites being taken out of bigger ones and smaller ones scoffed whole. Not even birds are safe with recent film showing tigerfish leaping out of the water to catch birds on the wing. Another resident of South America is one of the most notorious man-eaters of them all, the piranha. Equipped with razor-sharp teeth this killer fish is well-known for its frenzied attacks in which a shoal can strip a man to the bone in less than a minute. Of all the species of these carnivorous fish it is the red-bellied piranha (Pygocentrus nattereri) that has the most fearsome reputation. Growing to about 50cm (nearly 2ft) these have the sharpest teeth and strongest jaws of all piranha as well as living in groups of up to 100. Well, if this was the whole story then the piranha would be a little further up our list of deadly fish. In reality much of this killer fish’s reputation is hype, although as with many legends there is an element of truth. Over the years there have only been, at most, a few deadly attacks by piranha – so hardly the scourge of the Amazon we have been lead to believe. That said they are more than capable of carrying out the kind of attack we have all heard about and have been responsible for innumerable nasty injuries. So where did their killer reputation come from? Perhaps most recently it was bolstered by the 1970s horror movie, Piranha, which cashed in on the success of Jaws. However, it was back in the 1900s that they really got their bad rep. A young Theodore Roosevelt (former president of America) visited the Amazon and local fishermen were keen to impress with a display of the piranhas ferocious behaviour. They blocked off a small area of water that was full of piranhas and starved them for several days. When Roosevelt visited an unfortunate cow was thrown into the water. Not failing to live up to their reputation the piranhas made quick work of the cow reducing it to a skeleton in a matter of minutes. Unaware that the episode had been set up for his benefit Roosevelt wrote about the killer fish and the rest is history. Call it what you want – puffer fish, blowfish, swellfish or even fugu – it is hard to imagine how something this cute could possibly kill you. In fact it is hard to feel anything but sympathy for these unfortunate little fishes. Being at the less capable end of the swimming spectrum the puffer fish’s one defence against predators is to gulp down a few mouthfuls of water and swell up like a ball. If this doesn’t do the job of scaring off potential hunter then it is generally bad news for everyone concerned. You see, the pufferfish is actually the second most poisonous animal on earth. 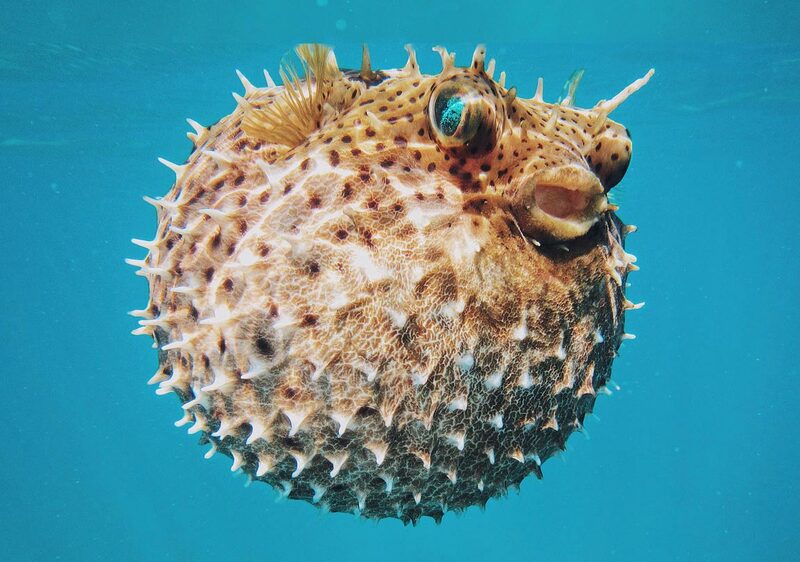 Puffer fish contain the poison tetrodotoxin (TTX) which is also found in the blue-ringed octopus and is at least 20 times more powerful than cyanide. Only the poison dart frog produce a more powerful poison. The symptoms of puffer fish poisoning usually start with a tingling / numbness of the lips, followed by dizziness and nausea. After this things can rapidly go downhill with shock and muscle paralysis setting in. If this happens then the victim is unable to breathe leading to death within a matter of hours. There is no antidote. Of course this doesn’t stop people eating puffer fish, in fact in Japan people pay large sums of money for the privilege. As long as the fish is prepared properly, which involves removing all trace of the liver and other internal organs, it is safe to eat. Unfortunately this is easier said than done and only chefs licensed to do so can prepare the fish. Their training takes up to 2 years and has a greater than 50% fail rate. Even the eating fugu (its Japanese name) can be akin to playing Russian roulette with around 5 people dying every year. Measuring up to 2.5 m (8 ft) in length, and 20 kg (44 lb) in weight nearly 80% of the electric eels body is dedicated to producing electricity. Effectively an enormous battery these fish can put out a shocking 600 volts and 50 milliamps. Admittedly they can only do this for a fraction of a second but that is long enough to shock its prey (smaller fish) into a stupor whereupon it can easily hoover them up. This taser-like effect is not only used on prey but potential predators. Although it is unlikely for a single shock from an electric eel to kill a healthy person outright it would be somewhat akin to be hit by a pretty powerful stun gun. Obviously this would be problematic if they were in the water as there would be a good chance of drowning. 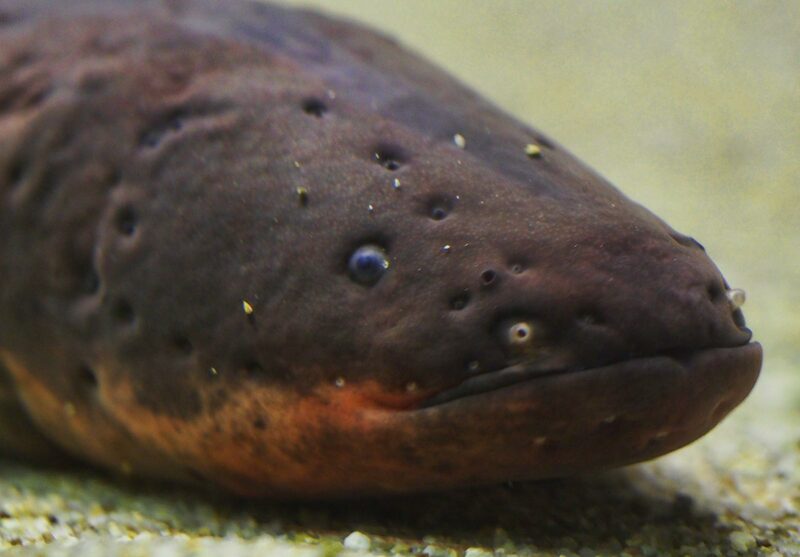 In addition the electric eel is capable of delivering multiple shocks and in some cases this may be enough to cause respiratory or heart failure. A quick look at the photo above will probably be enough to convince you that the barracuda belongs on this list. There are actually 22 species of barracuda but only the great barracuda (Sphyraena barracuda) has been involved in attacks on humans. At up to 6ft (1.8m) long and with a mouth full of huge, razor-sharp teeth this missile of a fish is more than capable of inflicting some serious damage. To be fair to the barracuda it doesn’t go looking for humans to attack, it is primarily interested in small to medium sized fish. To catch these it uses ambush tactics and its incredible turn of speed to chase them down. It appears that in many of the recorded attacks on humans shiny objects such as jewelry may have been involved. These are thought to attract the barracuda which see them glinting and mistake them for prey fish. Other incidents have taken place with spearfishing where they try to steal the fish off the spear. The result of any such attack can be serious leaving the victim with deep lacerations, often resulting in tendon or nerve damage, or in the worst case severing blood vessels. Patching up will invariably require stitches, the number of which can run into three figures. Barracudas also have a reputation for occasionally causing injury to people in boats when they leap out of the water like some sort of surface-to-air missile with teeth. In one reported attack in Florida a female kayaker was almost killed when hit by a barracuda leaving her with broken ribs and a punctured lung. 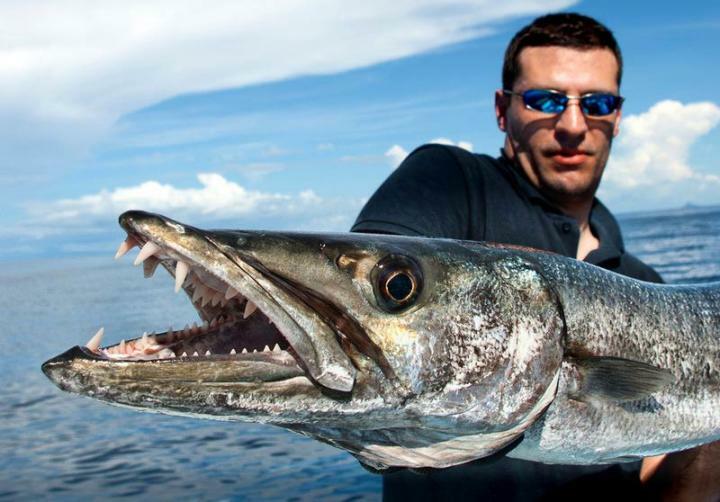 Maybe I’ve convinced you that the barracuda is in fact one of the world’s deadliest fish – it certainly has the potential. However, statistically there have been very few serious cases of barracudas attacking; but there is something else… Should you ever be tempted to eat a barracuda, don’t! There flesh is often laced with incredibly poisonous ciguatera toxin which will at the very least leave you feeling very unwell. Symptoms can last from weeks to years, and in extreme cases as long as 20 years. 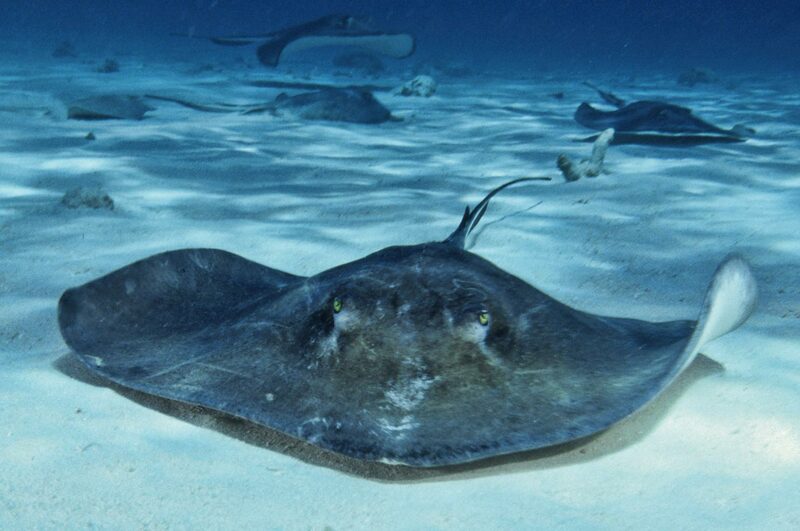 The stingrays are a family of around 200 different species all of which, as the name suggests, possess a venomous sting near the base of their tail. Generally considered to be rather docile fish stingrays usually only attack in self-defense. In fact the most common injuries inflicted on humans tend to be from stepping on a ray which is hiding under the sand in the shallows. All the same, while not life-threatening, these stings can be extremely painful and cause secondary symptoms such as local tissue death, nausea, vomiting, diarrhea and muscle cramps. In addition the sting is particularly sharp and barbed meaning it can cause significant damage when it is withdrawn from the wound. In some cases the sting will break off in the wound leading to prolonged exposure to the venom and an increased possibility of infection. 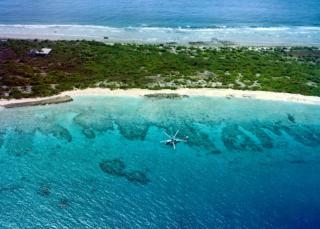 Most encounters with stingrays only involve smaller species, close to shore. But as the size of the ray increases so does the size of the sting. A 2.5 metre (8 ft) ray can have a sting as long as 20 cm (8 inches) and this can be potentially lethal as was the case with the death of Australian “Crocodile Hunter” Steve Irwin. He was fatally stabbed in the heart while filming a 2 metre (6 ft) bull ray back in 2006. Although incredibly unfortunate this is not the only time a human has been killed by a stingray, any sting to the abdomen or chest has to be considered dangerous. At the time of writing this article a man was killed in Tasmania in just such an incident. A quick look at this slender-looking fellow will tell you where these fish get their name from. But whilst they may appear needle-like at a squint, they are a little too big to mend your socks with as the biggest species can reach over a metre (3 ft) in length and weigh around 4kg (9lbs). 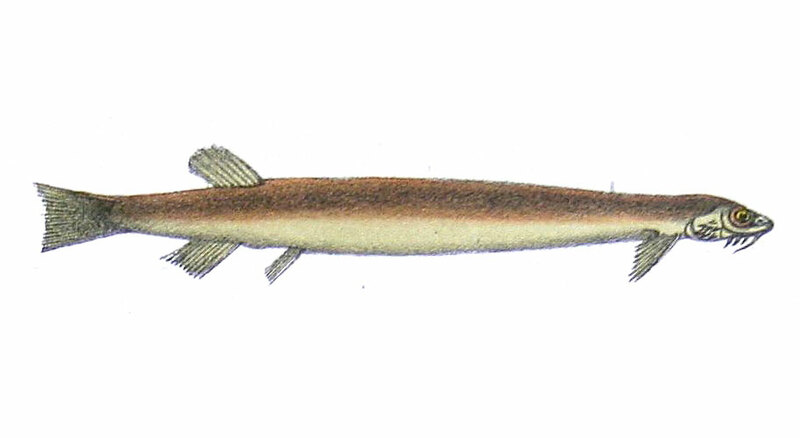 The streamlined shape of the needlefish allows them to speed through the water to chase down their prey. Speeds of up to 60 km/h (40 mph) are not unheard of. However, the combination of this speed and their bony, super sharp beaks makes them one of the most dangerous fish on the planet. Hard to believe, especially as this is a fish you’ve probably never heard of, but the statistics and a few horrific incidents back up the claim. 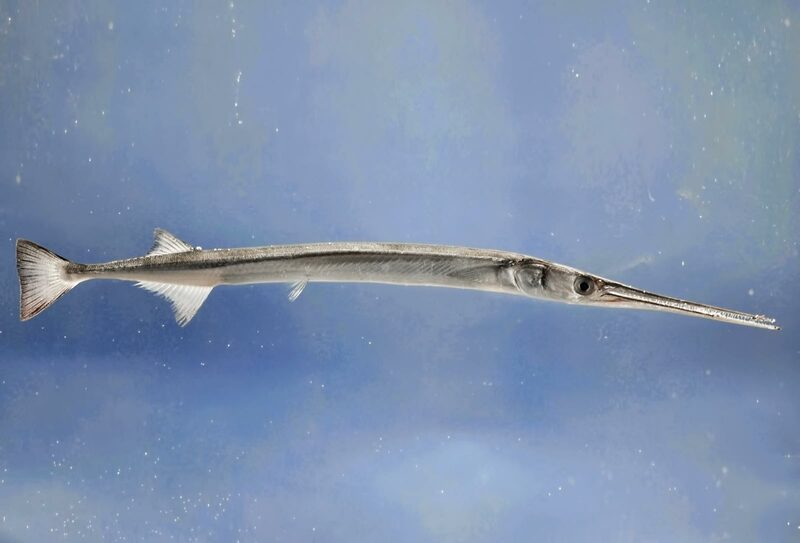 The needlefish are related to flying fish and as well as swimming at great speed they are also partial to leaping out of the water. Think about that – a sharply pointed, metre-long fish travelling through the air at 60 km/h – that’s a spear! But what are the chances of it ever hitting anyone?! Unfortunately high apparently. A major problem is that groups of these fish seem to be attracted by lights from boats which makes them a real danger to night fishermen in the Indo-Pacific area where they are considered more of a danger than sharks. There have been a number of fatalities over the years caused by needlefish. In one case an unfortunate 10 year old Hawaiian boy was killed by a needlefish which leapt out of the water and pierced his eye and brain. 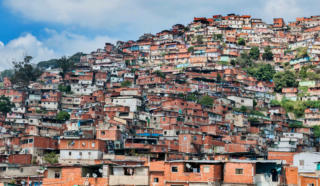 There are two cases of divers being killed after being impaled in the heart by the fish and other cases of people dying after being struck in the neck. For every death caused by a needlefish there are any number of serious injuries. One Russian woman was left paralysed after being hit in the neck and several kite-surfers have suffered severe leg and foot injuries. 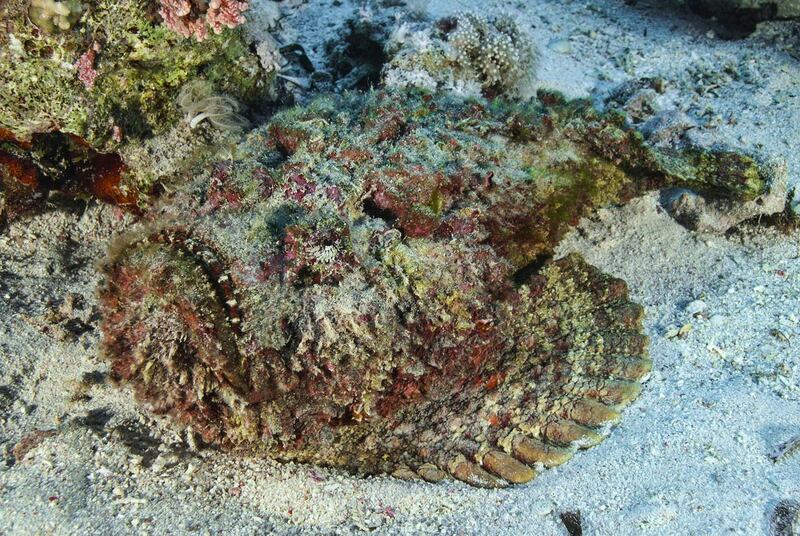 The rather sad looking stonefish has one thing to be happy about – it’s the most venomous fish on the planet. With an array of 13 needle-sharp spines positioned on its back this coastal swelling fish also has near perfect camouflage, almost as if it were waiting for some unfortunate beach-goer to stand on it. To make the possibility of this happening just a little bit greater, the stonefish is capable of surviving out of the sea for up to 24 hours. If you were to step on one of these miserable looking fish you would certainly know about it. The powerful neurotoxic poison of the stonefish is not only potentially deadly but excruciatingly painful. If the stories are to be believed, people stung by a stonefish have been known to beg to have their leg cut off to stop the pain. I got spiked on the finger by a Stonefish in Australia … never mind a bee sting. … Imagine having each knuckle, then the wrist, elbow and shoulder being hit in turn with a sledgehammer over the course of about an hour. Then about an hour later imagine taking a real kicking to both kidneys for about 45 minutes so that you couldn’t stand or straighten up.